A joint symposium was held at the University of Strathclyde, Glasgow with the Commission for Geography Education of the International Geographic Union in August, 2004. This was a stimulating event attended by more than 140 people. We hope to hold another joint meeting with the IGU Commission for Geography Education in the future. The deadline for submission of abstracts for the XXII International Cartographic Conference at A Coruna, Spain in 2005 is 1 November 2004. Cartography and children (including educational products) is one of the conference themes and we aim to have an excellent selection of papers. Abstracts can be submitted online. We propose holding a joint seminar with several other ICA commissions in Madrid, just before the ICC 2005 in A Coruna. This will be held on 6-8 July, 2005. The seminar theme will be on teaching map use via the internet. There will be an additional charge for this seminar. The local organisers are currently negotiating alternative accommodation arrangements which will include the choice of inexpensive student residences as well as hotel accommodation. There will be a website giving further information in due course and I shall email when this is available. This advance notice is provided so that colleagues can plan their diaries for next summer. Jesús Reyes (Budapest) and Ana Maria Garra (Buenos Aires) have kindly provided the following information about their joint research project. Title: "Map use by children in school age - teaching and using map concepts in Argentina and Hungary". - Analysis of the actual situation in the teaching of map concepts in both countries. - Research about the use of maps by teachers and pupils in the elementary schools. - Identification of difficulties to face during the teaching of map concepts. - Recognizing of the positive experiences on teaching of map concepts, in interest of possible mutual adoption of them in both countries. We are planning to present the results of this work in national and international events, to publish it in different printed scientific reviews and to place it also to the Web. The planned website is going to present in detail all the questionnaires, databases, analysis made during this research. This is very important, because specialists from other countries can consult freely this data and to use it in similar investigations. Based on the results we wish to prepare a study for national institutions related to map teaching for children (Ministries of Education, Research Institutes, Teachers' Associations, etc). These studies will contain proposals to improve teaching of map concepts, based on results and experiences in both countries. These new Bulgarian school atlases and wall maps provide the best learning support for students. The aim is to offer the best quality in modern cartographic products in the Bulgarian market. 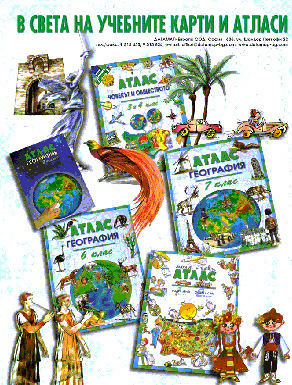 The content of all the atlases, the outline maps and the wall maps is developed according to the school curriculum. After compilation they are approved by the Ministry of Education. These new cartographic products are made available to students and teachers as a result of expert cartographic advice, the ideas and efforts of schoolteachers, university professors, cartographers and specialists in Geographic Information Systems. Professional artists illustrate them with skill and the art design makes them interesting and attractive. Dr Bandrova is the author of really interesting, detailed and accurate atlases, outline maps and wall maps for students in school years 1-8 (ages 6-15, respectively). The atlases match the needs and interests of students at these ages and support the learning in geography and history. The presentation and design base on classroom research into children's thinking about maps. The children's own ideas are incorporated into the atlases and wall maps. as well as to produce similar products for foreign students. Published Bulgarian cartographic products with continents' and world' content could be adapted for foreign schools with similar curriculum. We could compile also national atlases for foreign schools with teachers', professors' and specialists' advice from the corresponding country. The cartographic products could be adapted for ordinary use or for special users in any language. As the national representative to ICA, I would like to inform the Commission on Cartography and Children that a book related to the use of maps has been published for Iranian children. This book has been designed for children at age of 7 to 9 years old. The book is about the adventure of a little boy who has been lost in a big jungle but a map helps him to find his way leading to his home. The story is described with simple poems and nicely cartographic maps that are understandable for children. The characters of the story are animals that assist the little boy to use the map properly. In this book the meanings of scale, map use, natural features, man-made features, colors etc. have been explained by a simple way. This book has been produced in the National Cartographic Center of Iran (NCC) for event of Children of the Word Day in 2004. The poems and cartographic design have been carried out by Mr. Alireza Tayyar and Mrs. Marziyeh Mahmoudi respectively. All other activities related to the production of the book have been accomplished by the Cartographic Department's staff at NCC. In addition to Farsi language we plan to translate the book in English and combine two languages. Therefore, it could be used by much more children. As soon as the book gets ready to be published in two languages, I will send your commission a new version of it. Please let me know of any other conferences, publications or news items that are of interest to Commission members and I will circulate details at the next opportunity.